Because of fears that litigation is too costly, reduction of litigation expenses has been the touchstone of procedural reform for the past thirty years. In certain circumstances, however, the parties have incentives—both rational and irrational—to spend more on a lawsuit than the social benefits that the case provides. Present and proposed reform efforts do not adequately address these incentives, and, in some instances, exacerbate the parties’ incentives to overspend. The best way to ensure that the cost of a lawsuit does not exceed the benefits that it provides to the parties and society is to control spending directly: to require the parties to file and live within litigation budgets. 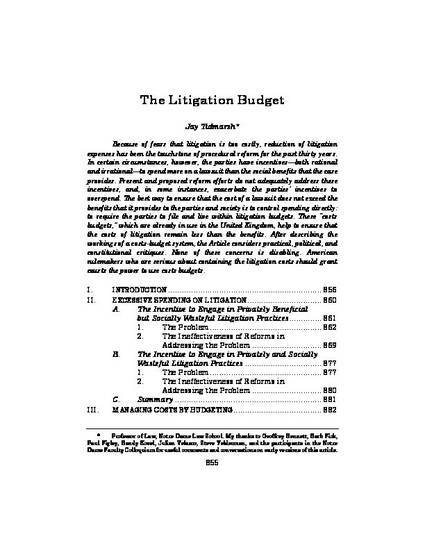 These “costs budgets,” which are already in use in the United Kingdom, help to ensure that the costs of litigation remain less than the benefits. After describing the workings of a costs-budget system, the Article considers practical, political, and constitutional critiques. None of these concerns is disabling. American rulemakers who are serious about containing the litigation costs should grant courts the power to use costs budgets.